The sun is high, the snow is bright, and we’re in a mad dash with a crush of teenaged ski racers to catch an 8 a.m. ride on the Matterhorn Express. Rock skis tangle as their owners, wearing stretchy Lycra, run toward the red car, hell-bent on getting up the mountain first. We squeeze in before the doors close behind us and the excitement builds as the gondola slowly floats up past the Matterhorn. The Matterhorn! To our right, white clouds swirl around Europe’s most famous peak, its iconic lines and sheer face at once elegant and deadly. It’s a thrill to see, but I’m thrilled I’m not a good enough mountaineer to feel pressure to climb it. 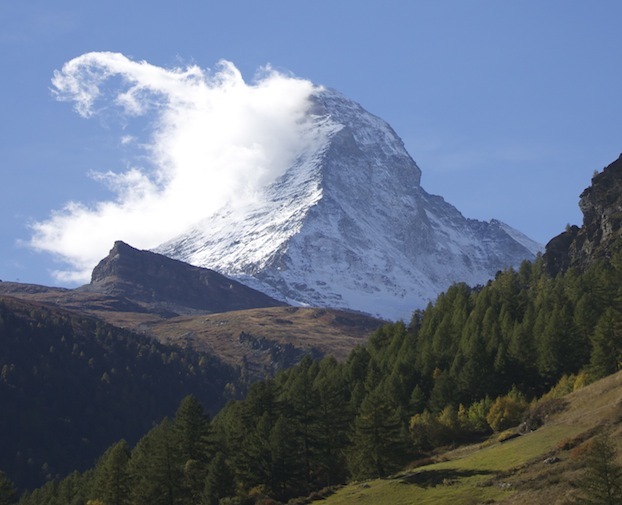 Instead, I focus on the peak to the left, the 13,661-foot Breithorn. With a hook-nosed summit, its shape resembles an eagle. From this vantage point the angle of the slope is intimidating. But our morning’s objective is to summit it by noon. We exit the gondola at roughly 12,000 feet and I rope in next to a Scottish explorer, a Swiss mountain guide, a Nepali Sherpa, a few fellow Americans, and our host from Zermatt. Our mission is to have a good time and get down alive. At around noon, after a change into crampons and a thigh-burning climb, we summit. As we bask in the sunshine and glory of the jagged peaks of Switzerland, Italy, and France, I’m thinking about the week ahead. Here we are, in Switzerland, a bunch of strangers from around the globe attending the 2012 Adventure Travel World Summit, but we’re undeniably bound together to achieve a common goal, whether it’s climbing a peak or taking adventure travel to a higher level. If only we could all be like the Swiss, our hosts for the week. Their trains run on time (down to the second), they put a premium on sustainability and environmental protection, and they feel no guilt while indulging in wine, fondue, and the world’s finest chocolate.